Here’s a simple question: When do critics fail? For many liberal-minded friends and colleagues of mine, Davis’s comprehensive critical dissection of Dubai summed up their own worst fears: that Dubai is all sickening shine and no soul, an air-conditioned bubble of hype whose hubris guarantees imminent cultural and ecological Armageddon. When I for my part raised my eyebrow at Mike Davis’s critique, then, I hit a raw nerve. But when I ask the question, “When do critics fail?” I mean it quite seriously. I’m not trying to imply any insistence upon ethical decency between critic and subject; we ought to be able to take that for granted. Rather, I am pondering what happens when a critic is confronted with an alien place that may bear superficial resemblance to what he has known but also may be critically different. From my limited view, Dubai’s desert experiment is akin to a petri dish of fast-track dreams and global ascendancy, like those natural history TV shows wherein millennia of evolution elapse in seconds. From an urban, political, and anthropological perspective, Dubai makes for compelling drama, offering a case study of twenty-first-century mutant economies growing outside of Europe and the US. This may be problematic for a number of reasons, but I’m not convinced that Dubai is a monoculture of “evil,” as Davis would have us believe. For all its sardonic, rancorous vim, Davis’s hatchet job seems too perfectly neat in its structured negativity. Did he write with a critic’s sleight of hand, in the name of the Left? And might the Left, like the Right, also have its own critical apparatuses that forsake the reality in front of them in favor of an obligatory idealism? Are both sides equally guilty of fantasizing about the future only on their own terms? Is the Western critic’s disgust with Dubai simply a veiled disgust with the West? Was Koolhaas’s a harsh comparison? Maybe. But he and AMO make this point: When critics bring their conclusions, a priori, to a place, it prevents what could be a productive confrontation between critic and site, in turn preventing any unexpected or unforeseeable critical responses. Predestination, instead, governs. There’s no self-criticism, no threat of mea culpa, and no promise of unsettling Alterity. Hard empiricism sometimes gives way to the delusional hypothesis. I too would like to suggest that places such as Dubai (importantly, an ex-colony) act as a kind of narcissistic, mutating mirror to the emerging anxieties of the West. Lacan pointed out in “The Mirror Stage” that a subject can only understand her or his own being-in-the-world by seeing a reflection in a mirror, by comprehending the self as an image. What if this vindication and assurance sought in the projected image of the Self-as-Other could also be extended to nation-states and civilizations? Dubai operates as one of these Zeitgeist mirror-surfaces for the West (and, increasingly, for other parts of the Middle East, such as Bahrain and Qatar). For the neoliberal Right, Dubai is a phantasmagoric setting crafted in the perfect image of unbridled market capitalism (minus the democracy). For the political Left, Dubai may be just a grotesque reflection of the West’s worst endgames, manifest as that evil paradise. SHORT-TERMISM: Dubai builds at an unprecedented rate. Skyscrapers jolt into the skyline like cutouts advertising a futuristic utopia that could never really materialize. Yet there they are, offering millions of square feet of potentially inhabitable space to live, work, and shop in. The doubtful ask whether these buildings will ever see actual lived life. How can Dubai try to be the world’s biggest transient hub and also a place of permanence? The orgiastic frenzy, they say, can’t be sustained. ECOCATASTROPHE: Creating an indoor ski slope in desert climes emphatically declares that ecology is not something to be tethered to, but to be augmented or even completely negated. As the ecologically conscious in the world strive to avoid eco-meltdown, Dubai flouts contemporary reality with oblivious arrogance, an act of total irresponsibility at the nation-state level. 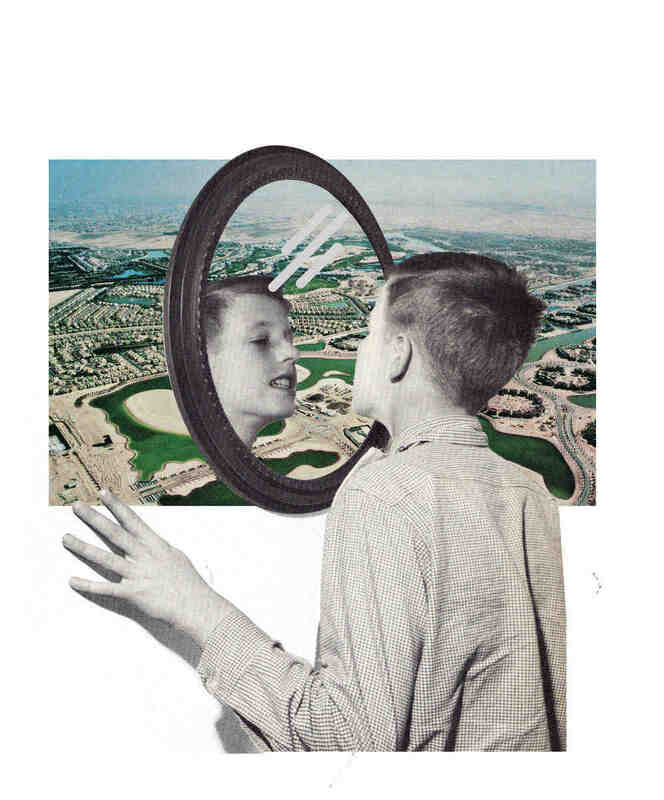 INAUTHENTICITY: Westerners seem to be on a desperate hunt to seek “reality” in Dubai. When they don’t find what they’re looking for, in their ensuing disappointment, they have no other choice than to yell, “FAKE!” What such critiques fail to highlight is that there is, of course, a reality in Dubai, and a history. Dubai’s reality is one that not many have known. Copies and imitations are not abstract ciphers but productions of reality in their own right. (A fake Gucci handbag is still a real handbag.) And with each imitation and recreation, the status of the so-called “original” alters. In the meantime, traces of civilization in the emirate go back to 3000 BC. More recently, Bur Dubai, the original settlement along the Creek, became independent in 1833. The phenomenon of tax exemptions for foreign traders began in 1894, with exports of pearls and dried fish, and imports from India to East Africa. Already by 1908, there were 400 shops huddled around the Creek. The area has a deeply embedded relationship to a past structured around the movement of people and of products, arguably the very thing that has become the supermodern visage of Dubai today. When Dubai fails the Western critic’s litmus test of a “good city,” it fails because it doesn’t exhibit (or, worse still, even try to exhibit) Enlightenment values and forms. Political representation; the disestablishment of royal rule; the manifestation of “society” in institutions like museums, libraries, and universities: these are all in short supply. If the Enlightenment mandated the rule of reason over received convention, the modern city in the mid–twentieth century became the rationalist apogee of such principles, rigorously flat and therefore emancipatory. With the modern city (a la Hilbersheimer or Le Corbusier in the 1920s) having already unapologetically deleted all references to the past in favor of the ultra-new, is Dubai any worse for pulling out fantasies of the fictional past from its virginal desert? Perhaps there’s a sense that Dubai’s searing skylines, where towers congregate in a vision of ungrounded liberation, is what we in the West had predicted for our own cities back in the 1950s and ‘60s. Dubai, Singapore, Shanghai — they’ve built what we once proposed. And they’ve built it without our blessing or our cooperation. In a few years’ time, we’ll likely reach that mythic moment when China and India will become the first and second economies in the world. After all, they’re already the largest in terms of sheer population. Outsourcing and imports indicate that there’s about to be even more of China, India, and the Middle East flooding the streets of Europe and the US. Surely the free market saw this coming? Given this imminent emasculation of the West, does the critic scald and sneer precisely because he knows that the West created the first versions of the very things that places like Dubai now want — skyscrapers, central business districts, air-conditioning, frappucinos, Topshop, Justin Timberlake, the illusion of an endless power supply, corporate corruption, infinite consumer choice, and promiscuity without penalties? In Mary Shelley’s Frankenstein, Dr. Frankenstein’s biggest disappointment was that his creation didn’t love him. His biggest regret was setting the precedent in the first place. So when do critics fail? When they form intractable judgments before they’ve even begun to open their eyes. It’s interesting to note that much of the critical dismissal is based on aesthetics. Endless acres of mirror-glass facades and a compulsive sampling of the world’s best (and worst) bits signify supposed aesthetic “unoriginality.” Here, aesthetics are read as an embedded form of political and ethical agency. In this reading, Clement Greenberg’s disdain for kitsch reigns supreme. Today’s heavyweights likewise deplore kitsch because it signifies depoliticized frivolity and easy, mindless foreplay for the masses. What is the story of the story? It’s the future history to be written about the unwieldy cast of players, crooks, charlatans, saviors, doom-mongerers, cowboys, and visionaries who have rushed or been pushed to commit to Dubai. This story will contextualize the myriad motives that drive the migratory mobilization: desire, hope, desperation, fear, and the belief that for this moment, this is the place to be.